While Laury's been living and working in the States, I've collected her mail and kept an eye on her garden. I try to catch things blooming and send her a photo or two, so she can see how her flowers look. I know she misses being here to take care of them and enjoy their beauty. 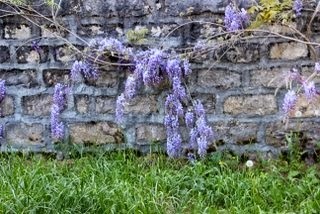 She has two wisteria vines along the wall of her front yard. You can see both in this photo. Although both were planted at the same time, this one (which we have dubbed 'the wild one') never bloomed at all until it put out 2 or 3 flowers last spring. This year it's stunning! 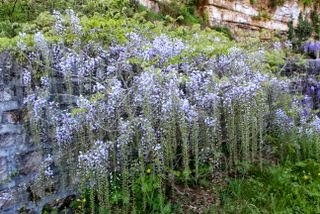 Its racemes are twice as long as its neighbor's, very dainty and delicate. 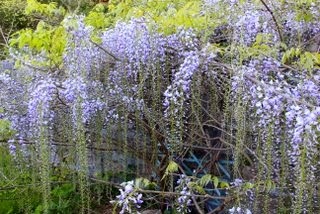 I believe it's a wisteria floribunda, but don't quote me on that. 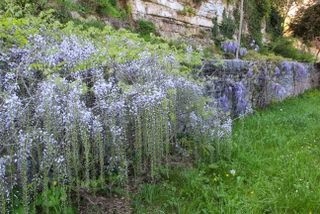 It's hard to identify varieties from Google images. I sent Laury photos of both yesterday asI'm afraid they will be done blooming by the time she arrives in two weeks. Wish I could have bottled some of their fragrance to send her...it's heavenly.